"Squanto went at noon to fish for eels. At night he came home with as many as he could well lift in one hand, which our people were glad of. They were fat and sweet. He trod them out with his feet, and so caught them with his hands without any other instrument." After their incredible journey across the Atlantic, the Pilgrims landed at Plymouth (in present-day Massachusetts) in early winter, not the best time to find or raise food of their own. Without the help of the local Native Americans, like Squanto, they might not have survived. If Squanto went in search of eels today's rivers, streams or estuaries along the eastern coast of North America, he might come back empty-handed. Catch data suggest that the American eel (Anguilla rostratao) population is declining. For example, yellow eels in the Chesapeake Bay and Lake Ontario declined by 50% and 99% respectively from 1994 to 2004 (ASMFC 2006). The American eel is one of two Atlantic eel species (the other being the European eel). American eels complete an incredible journey during their life cycle, which consists of several stages including glass, yellow and silver. They travel up to 6000 kilometers (~3700 miles) from their spawning grounds in Sargasso Sea, near the middle of the North Atlantic Ocean, to brackish and fresh water environments as far north as Greenland and as far south as South America. Within the United States, American eels are found in eastern and southern watershed systems as far inland as the St. Lawrence River system, the Great Lakes and the Mississippi River drainage. The American eel is a catadromous species. It spawns in saltwater habitats and matures in fresh and brackish water environments. 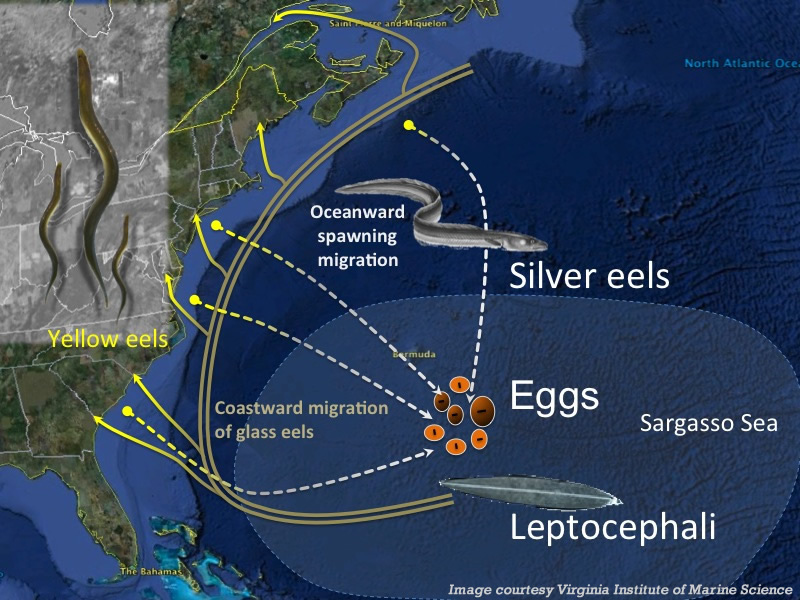 No matter where they mature, American eels are essentially all part of one population that migrates from the spawning grounds in the warm Sargasso Sea to enter a freshwater system on the eastern and southern coasts of North or South America. Eventually they return to the Sargasso Sea, with the roundtrip journey taking as long as 40 years or more. American eels are commonly referred to as "yellow", "silver" or "glass" depending on their life cycle stage. The larvae (leptocephali) are transparent or clear and commonly referred to as "glass eels". They swim weakly but mostly drift towards coastal areas for up to a year in the Gulf Stream eddies and coastal currents of the Atlantic. Once the glass eels enter the coastal estuaries, they become darker and rounder. Now locally known as "elvers" they grow and travel upstream. As the elvers become older, their pigmentation becomes more distinct. Now recognizable as male or female, these "yellow eels" spend the next 6 to 40 years living and growing in their freshwater habitats. They undergo one final metamorphosis into the "silver eel" stage when they become sexually mature and begin the long journey back to the Sargasso Sea. It is a one-way trip – the silver eel's' digestive tracks disintegrate during this final stage. The state of the American eel population varies by depending on location. In some areas eels have nearly or completely vanished while in others, sub-populations are more stable. Experts generally agree that American eels have shown an overall decline in the last two decades to historically low levels. Available data on yellow eel populations may indicate a species-wide trend that could ultimately result in irreversible population declines (ASMFC 2006). Declines in Lake Ontario populations and elsewhere led U.S. wildlife agencies to review the status of the American eel in 2004. In 2007, the U.S. Fish and Wildlife Service ruled ruled that protecting the eel under the Endangered Species Act was not warranted. The USFWS concluded that while eels have declined or been extirpated in parts of their historic range, the tremendous adaptability, resiliency and geographic distribution of the species make it unlikely to become extinct. Migration barriers, water polution and habitat loss are traditionally recognized as contributors to eel population declines. Recent studies link declines to changes in ocean conditions and climate change. Efforts to restore American eel habitats and remove migration barriers include grants from the American Rivers and National Oceanic and Atmospheric Administration (NOAA) Community-Based Restoration Program River Grants. Recommendations made in American Eels: Restoring a Vanishing Resource in the Gulf of Maine, by the Gulf of Main Council on the Marine Environment, support giving consideration to the installation of eel ladders and removal of other barriers to eel migration as part of the relicensing process for hydropower dams. Several dams in Gulf of Maine watershed states are coming up for relicensing in the next five years. Senators from these states have asked your team to prepare an Earth system science analysis of the causes and implications of the decline in the American eel population to justify funding restoration efforts in preparation for relicensing hearings. Distribution, biology and management information through 2006. A webinar from Ohio State University includes: invasive species found in the Great Lakes region, potential impact of climate change on the ranges and effects of invasive species in the region, and research needs to address future conditions. The decline of the American eel in Lake Ontario. Comprehensive report on the distribution, status and more of the American eel. In this 2010 NOAA sponsored NSTA web seminar Dr. John Casselman discusses a wide range of indicators that climate is effecting American Eel populations in the northeastern United States and the subsequent effects on commercial catch and increasing price of eels on the market. Free to non-members. Explores connections between population declines and the North Atlantic Oscillation. The Daily Green 2008. This teacher-designed site provides comprehensive tools for exploring relationships, habitats, food-webs and more. Extensive information about the American eel and hundreds of other animal and plants for student investigation. This collection of case studies, activities and resources focuses on changes in seven ecoregions and impacts on seven species. Simulate American eels and the hazards faced by eels in physical activity portraying their life cycle. How does the American eel fit into the food-web? What plant and animal species are part of its habitat and how do they contribute to or threaten its survival? These questions and more can be explored through a series of investigations focusing on the American eel. Investigations of interest might include: Food Web Design, Three Degrees of Separation Game, Symbiotic Relationships and Habitat Exploration. In each case, begin with the American eel and then explore the additional items required by the investigation. Loss of habitat affects eel populations. Study the characteristics of a particular estuary or wetland that is important to protecting the American eel. Are invasive species contributing to the American eel population decline? Focus on invasive species affecting specific geographic ranges of the American eel - examples: Great Lakes, Mississippi River basin, Chesapeake Bay, etc. or tackle specific predator, prey and parasites that affect the American eel population or sub-populations. This NOAA Ocean Explorer investigation explores the role Sargassum seaweed mats might play in the reproduction of American eels and other species in the Sargasso Sea. and volunteer to monitor migrations, remove barriers or raise community awareness.